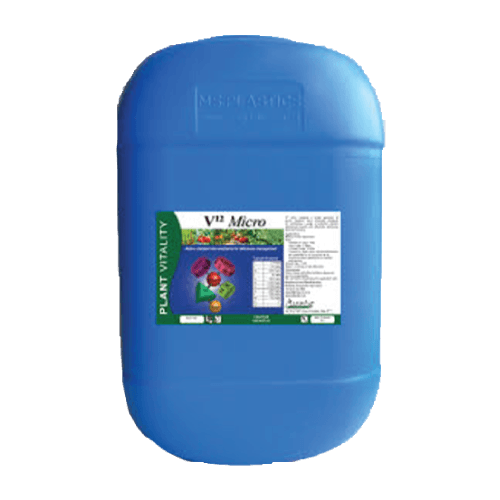 Amino chelated micronutrients for deficiency management. V12 Micro contains a broad spectrum of amino chelated micro-elements designed for combating a range of potential nutrient deficiencies. Apply when nutrient deficiencies are suspected or in a program as an insurance policy against micro-nutrient deficiencies. Dilution: Min 1:100 Apply in morning or late afternoon. Precautions: When mixing with other fertilisers always jar test for compatibility. Mix well before dispensing into application tank. Ideal for resolving unidentified deficiencies. A full range of amino chelated micro nutrients for prevention of or quick correction of unidentified micro nutrient deficiencies.